We check your website health from multiple locations around the world in 30 second interval. Just enter your Cloudflare API key, batch import DNS entries and define backup servers. Receive email alerts and slack messages about your website condition instantly. You need a Cloudflare account and your website traffic running through the Cloudflare network (or use Cloudflare for DNS only). Our nodes check if your website is responding on the primary IP (checking for HTTP response codes / string on page). As soon as your website becomes unavailable, all traffic will be switched over to the configured backup IP address automatically. This can be another server or load-balancer – also in other geolocations. We use the Cloudflare API to change the DNS settings for your website. Failover is done by replacing the IP address. 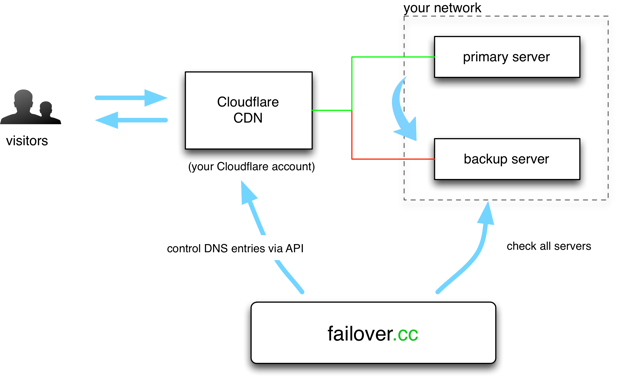 By using Cloudflare in proxy mode, your backup server is available in seconds in case of failover. Unlike common DNS failover you have full control of the traffic flow and all clients are sent to the backup server immediately. However, you can use our service for DNS failover if you want to (by using Cloudflare as a DNS provider). That way traffic runs to your site directly. We also support Round-Robin DNS + failover, by removing the DNS entries of failing servers. There can be multiple backup servers. All backup servers are checked frequently so there is no failover to a broken server. You will be notified by email and slack messages of the failover and the recovery (failback). Also if there are any problems with the backup servers. And of course you can trigger a manual switchover to other servers with the web interface.